Tel Aviv, The Old North: The Daily Freier newsroom is currently in full panic mode, as news broke that Secret Tel Aviv opened a Sperm Bank. 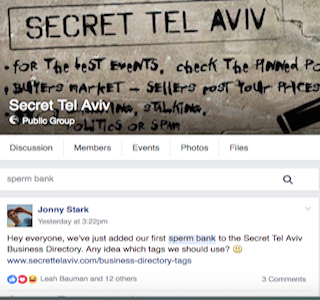 Secret Tel Aviv, the popular online community for English Speakers in Tel Aviv that strives to prove that Jews are completely bonkers, has added a Sperm Bank to its business directory, once again making the Daily Freier’s most ridiculous attempts at satire seem downright boring compared to real life. As frantic interns scurried from point to point in the newsroom grabbing messages from the old-time teletype machine and carrying coffee, the editorial staff gathered for a nervous meeting in the conference room. Yuval Weiss opened the meeting. “This is insane. It’s almost as if Jonny is testing us. Just to see how we react.” Guest Writer Lee Saunders was in a state of shock, almost bereft of his Droll English wit. “This is madness. A Secret Tel Aviv Sperm Bank??? Who knows what sort of wankers will show up.” Like we said, almost bereft. While the bulk of the Daily Freier staff struggled with the New Normal, reporter Aaron Pomerantz walked down to Secret Tel Aviv to get all the facts.